As some of you may know already, we had a bit of a scare over the last few days when I developed a blood clot in my leg. That has had no effect on the baby from what we’ve been told and won’t in the future. I’m doing well and am resting at home, driving myself nuts, ready to go back to work already! Regardless, after Trey and I spent a weekend at the Winnie Palmer Hospital, we discussed the real cause for concern and letting our family and friends know. Very few people can absolutely remember the worst day of their personal lives. I didn’t have one I that could recall, Trey had always said September 1989 was the worst day of his life (Hurricane Hugo), well that changed for us on June 6th. Trey and I excitedly announced that day that we would be having a boy, what we didn’t tell people was that there are some complications. That day we also learned that that our son was going to be born with a very rare and serious congenital heart defect. Since then, we’ve had several visits and tests that have discovered that the heart is his only issue. While it’s an issue we certainly wish didn’t exist, it quashed fears of it being a sign of something much more complicated. The baby is very safe right now, there is no immediate threat in the womb. Upon being born though, he will require a series of operations to repair his heart. We’ve been told by doctors that once it’s fixed he’ll go on and live as any normal child would. Is he the next Derek Jeter? Probably not, there will be limits to the amount of stress his body can take, but I think the fact that his parents stand a grand total of 10 feet 6 inches put the Major League dream to rest long before conception. How are we doing? Without a doubt the last two months have been very stressful, deflating, and uplifting at the same time. Those of you who have seen or talked to us probably haven’t noticed, (or maybe you have) we’ve done our best to keep it at bay. Not 5 minutes has gone by without a thought of our son popping into our heads, but that’s not always a bad thing. I’d say we’re now more excited for him to join our family, then we ever have been. Many of you knew Trey’s grandfather and his adoration of the Wizard of Oz. While every character in the movie (and books) was declared to be “his favorite”, the Tin-Man always seemed to stand out when he’d talk about it. Maybe it was the physician in him, I’m not sure. 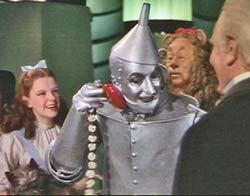 The Tin-Man made his way to Oz in search of a heart, only to be told by the Wizard that he had one the entire time. We’re not writing for sympathy, we’re writing for support. Trey and I know that the very friends and family who have been there for us through the good and bad (mostly good, thankfully) will be there for us again. October and the months following are going to be stressful, and while we’d give anything in the world to change that, the support our parents and siblings have already offered us over the last few weeks has suggested that we’re going to get through this, as will little “Tin-Man”. We are, however, going to need our family and friends more than ever during those weeks. * We promise, Tin-Man will not be his real name. Hello and welcome to Tin Man Flynn’s webpage. Just thought this would be an easy way to keep everyone updated as to Tin Man’s Journey.